When we put on our good “christian” face around other believers, but live like the devil at home, we are not fooling anyone but ourselves. God sees and He knows whether or not we are true believers. God knows if you and I be sheep or goat, saint or hypocrite. Choose you this day whom you will serve. If you are going to live for God then LIVE FOR GOD. If you are not, then don’t play the hypocrite. Hypocrites harm others and bring judgment upon their own heads for doing so. If you aren’t going to live the life then stop preaching about it! If you aren’t going to uphold God’s standards behind closed doors then stop “fronting” when around the saints of God. Being a fraud only works to ruin God’s reputation in the eyes of our children and unbelievers whose eyes are on us. 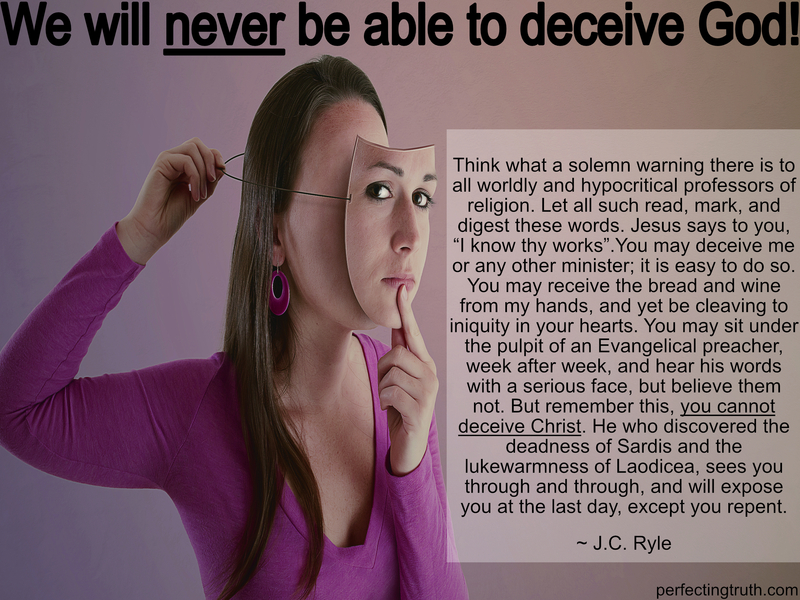 We cannot deceive God; it is pointless to even try!